Creating and maintaining a beautiful garden takes hard work and dedication, but the results are certainly worth it. Great gardens come in all shapes and sizes, and contain a number of elements, but at their heart is always one thing of especial importance: the lawn. Your garden lawn should always be the centerpiece of your garden, so if it looks damaged or out of shape, the garden as a whole won’t be seen at its best. Don’t worry, we’ve come up with this handy three-point guide that will help you get a lawn you’ll be proud of all year round. We all know that lawns need watering, especially during the hot, dry months of summer, but just how much should you water them and exactly how should you water your lawn? The first thing to note is that the soil type will determine just how much watering it needs, with sandy clay soils needing less watering per session than heavy clay soils, but as it holds less water it will need watering more frequently. 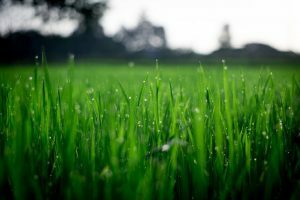 Generally speaking, your lawn will need at least an inch of water per week during cooler months and an inch and a half per week at the height of summer. It’s also best to water your lawn in the early morning hours, particularly during the summer when hot temperatures can cause water evaporation before it sinks into the clay beneath the grass. Aerating your lawn is a simple process, but when done correctly the results can be spectacular. Put simply, aeration is the act of punching holes in your lawn, and this is especially important if your lawn sees heavy usage. Over time, a lawn’s soil becomes increasingly compact, making it difficult for water to drain away and for it to receive the air and nutrients it needs to thrive. By making holes of approximately three inches in depth, the soil has room to move and breathe, and this leads to a much healthier and vibrant lawn. Aeration can be done by hand or via a special aerating machine, and it should be done at least once a year to soil that’s relatively dry. It’s important to fertilize your lawn if you want it to stay looking great throughout the seasons, but some fertilizers contain harsh chemicals which can be harmful to you and your family, wildlife, and plants. That’s why we recommend the use of natural, organic fertilizers, and as an added bonus a recent study into the effectiveness of lawn fertilizers by the prestigious Texas A&M University found that organic materials worked better than synthetic ones. When your lawn looks good, you’ll enjoy spending time there even more, and it will also be a great place to meet and greet house guests. Lawn care and maintenance can be as simple as watering it correctly, using organic fertilizer and aerating it on an annual basis.